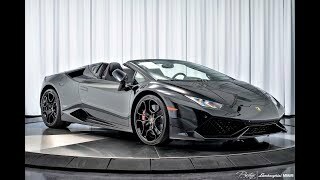 Lamborghini recently took the curtains off its powerful Lamborghini Huracan LP610-4 Spyder 2017. The model received numerous accolades for its powerful redesigned engine, infinite headroom and yes for the fact that it is comparatively affordable than the Ferrari, McLaren competitors. You might be aware that this isn’t the first release, as the model first came as successor to the Gallardo and after its release in 2015 has received numerous race-ready versions. 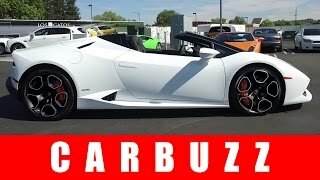 Let us have a look at the review of Lamborghini Huracan LP610-4 Spyder 2017 to know in detail about it. The interior details of Lamborghini Huracan LP610-4 Spyder 2017 doesn’t bring enough upgrade details but undoubtedly buyers will get, lots of comfort, looks and sportive touch for that infinite headroom cabin. The major highlight for this model is the redesigned dashboard and the center console. The latter comes with some new knobs and switches to ease the access. Model is housed with a 12.3 inch TFT display that features all the vital information. Another featuring stealing the gleam is the 390 watts RMS with a ten-channel amplifier and a queue of ten loudspeakers. 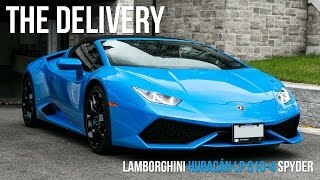 Thus rounding up the interior details of Lamborghini Huracan LP610-4 Spyder 2017 I would say, it has got more tech upgrades with refreshed looks and the new blue-black color combination. The exterior of Lamborghini Huracan LP610-4 Spyder 2017 is identical to its coupe sibling. The only major difference comes with its removable soft top. There is yet another interesting information about the soft top; company has designed it in a way that it doesn’t affect the model’s aerodynamic performance in a negative way and rather contributes to it. Apart from these, there are few more upgrades which include the vents integrated above the rear wheel arches. Talking about the front section we have the huge louvered lid being replaced by the new cover featuring two buttresses and smaller vents. Thus rounding up the exterior details of Lamborghini Huracan LP610-4 Spyder 2017 I would call it sportive and gorgeous. Beneath the hood of Lamborghini Huracan LP610-4 Spyder 2017 is a naturally aspirated 5.2 liter V10 engine delivering total output of 610 hp and peak torque of 560 nm paired to seven-speed dual clutch transmission. It has three driving modes-Strada, Sport and Corsa. 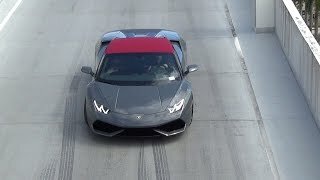 With this power the top speed of Lamborghini Huracan LP610-4 Spyder 2017 touches the mark of 201 mph while the 0-62 mph sprint can be knocked in just 3.4 seconds.